Notes: Ardfinnan Castle, is a castle which was built circa 1186 to guard the river crossing in Ardfinnan in County Tipperary, Ireland. 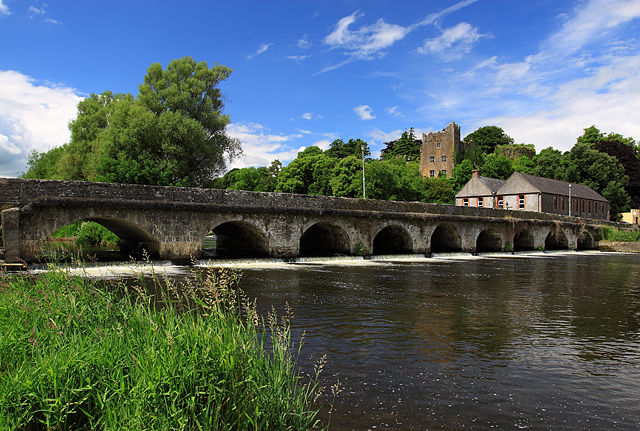 It is situated on the River Suir, seven miles west of Clonmel. The castle is currently privately owned and is not open for public viewing. The castle is positioned on a large rocky incline and it looks out over the Suir valley with the Knockmealdown Mountains to the south, and the Galtee Mountains to the northwest. The castle is rectangular in shape with square towers at the corners, and a fortified entrance gateway. The castle was built in 1186 by the Earl of Morton for Prince John of England, who would eventually become King John of England in 1199. The castle was destroyed by Oliver Cromwell's forces in 1649 and was partially restored and rebuilt in the 18th century and 19th century.